To advertise different products and services specialists use a variety of means. If previously, for example, a hundred years ago, it was quite usual signs, now grab the attention of a potential customer is getting harder and harder. One of the best ways to capture the attention of your client audience is to create a powerful and unusual advertising. There are many unusual advertising techniques used by companies and advertising agencies in order to attract customers. Contact Axiom Designs in Los Angeles and our experienced professionals will help you to create and realize most unique outdoor advertising for your business. Just remember the metal device that is installed on benches in parks. When the girls in skirts sat on these benches, text from a metal plate were printing (pressing) on their feet. And they – the girls – automatically became distributors of advertising. 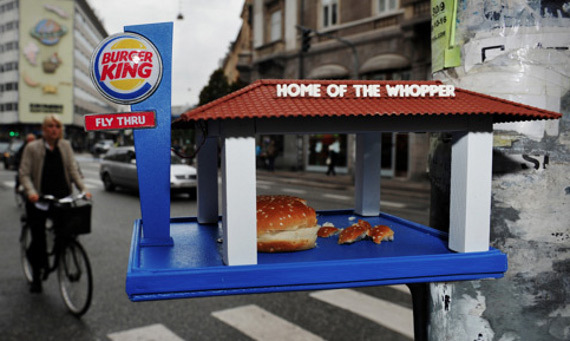 You can also remember the eco-friendly restaurants Burger King, which was built for the birds. Excellent advertising campaign, isn’t it? Another interesting and very effective form of advertising – inflatable billboards, which can be used in any waters. And more recently, in the advertising industry began to use another very powerful tool – the smells. There are categories of products for which the appearance or description is not as important as their flavor. To mind immediately come the perfumes or something incredibly delicious. While at the mall, you probably noticed that next to the perfume shops air always impregnated with a variety of attractive flavors. This is special marketing technique. Store employees simply sprayed smells next to their institution to attract attention and get the potential customer to come to them. What if to develop the theme of smells and use them in other areas of advertising? For example, to create unusual Scented Billboard. Examples of the use of Scented Billboard from the practice of real companies. Similar attempts have been made by different companies worldwide. And many of these attempts have proven that smell is really powerful tool to attract customers. In high-tech Japan Scented Billboard appeared in 2008. They are presented by NTT Com. This electronic displays, which are equipped with a special container with smells. This device is connected to the Internet. Thus, it is possible to manage “the release of odors into the atmosphere” at the right time, in any place where there is access to the Internet. Scented Billboard smell from the company NTT – this is not just an idea. It is implemented project that has proved its effectiveness. For example, a billboard for a flower shop with the scent of roses increased selling flowers twice. A billboard with the image of ice cream and the smell of this delicacy increased sales by 30 percent. Very good, isn’t it? The Japanese are not the only ones who have used Scented Billboard. 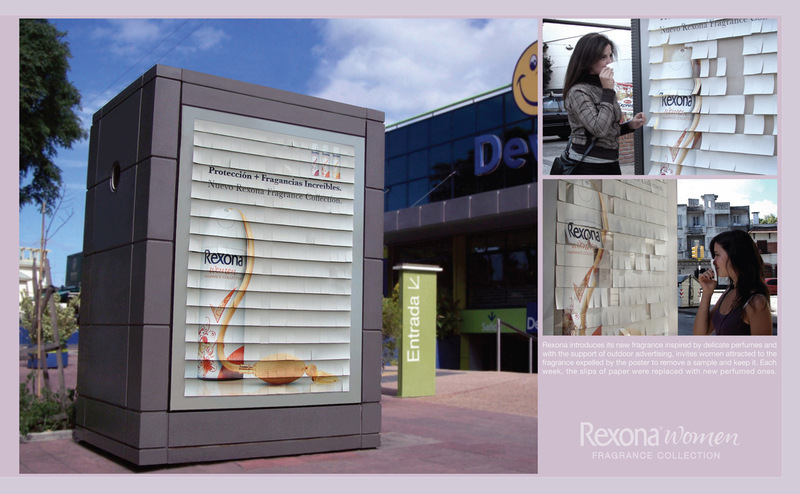 In 2009, the Uruguayan agency Lowe Ginkgo Montevideo has created for the company Rexona unusual banner. It consisted of a plurality of pieces of paper impregnated with the scent of new Ones. Of course, even a slight breeze carried the smell to the city streets and attracted the attention of passers-by. Moreover, it was possible to tear off a scented paper and take a sample of the smell with you. And to shield always smelled, weekly papers were changed for new ones. Americans used scented billboards advertising for The Bloom grocery stores. 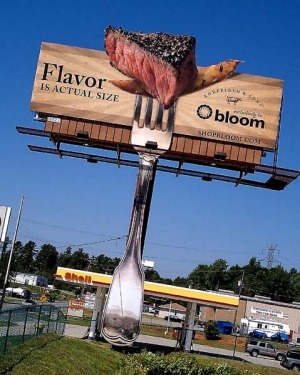 The billboard shows a grilled steak on a fork, and around grilled meat the air filled with the scent. You can imagine how this kind of advertising operate on the poor Americans. To pass this shield is simply impossible. The aroma is a special cartridge, which is located behind the billboard. And the smell of it being blown by a fan installed. These examples from the practice of companies from around the world show that the use of smells for advertising goods or services – is unusual, fresh and still less common marketing trick. If it is suitable to promote your business, you should think about using it today.